HALIFAX, NOVA SCOTIA – The Canadian Association of Chiefs of Police (CACP) today announced that Chief Constable Adam Palmer of the Vancouver Police Department has been elected to serve as the new President of the association for a two-year term. Chief Palmer was unanimously supported by the membership of the CACP during its Annual General Meeting in Halifax, on August 13th, 2018. 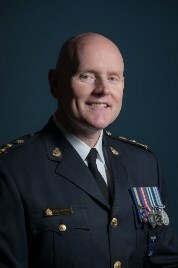 Chief Palmer took command as the 31st chief constable of the Vancouver Police Department (VPD) in 2015 after serving as Deputy Chief between 2010 and 2015. Born and raised in the Vancouver area, he began his career with the VPD in 1987, where he has worked in a variety of operational, investigative and administrative areas. Prior to joining the VPD, he studied business administration at Simon Fraser University and worked as a correctional officer. Chief Palmer sits on the Metro Vancouver Transit Police Board, the Canadian Police Knowledge Network Board of Directors, and the Criminology Advisory Committee for Kwantlen Polytechnic University. He is a Board member of the Combined Forces Special Enforcement Unit and is a member of the Criminal Intelligence Service of Canada - National Executive Committee. Chief Palmer has been a member of the CACP since 2010, and has served on the association’s Counter-Terrorism & National Security as well as the Organized Crime committees. In addition, he’s an active member of the BC Association of Chiefs of Police, the International Association of Chiefs of police, and the Major Cities Chiefs Association. This marks the end of Gatineau Police Service Directeur Mario Harel’s presidency and the reins of the CACP were officially passed on to Chief Palmer during an event held Tuesday night, August 14th. The Canadian Association of Chiefs of Police was established in 1905 and represents approximately 1,000 police leaders from across Canada. The Association is dedicated to the support and promotion of efficient law enforcement and to the protection and security of the people of Canada. Through its member police chiefs and other senior police executives, the CACP represents in excess of 90% of the police community in Canada which include federal, First Nations, provincial, regional and municipal, transportation and military police leaders.